If you wish to receive this Bulletin, please ask by EMail, specifying the Adur Torpedo with your full name. The Adur Valley eForum covering all aspects of life in the Adur Valley commences. You can join by spending a few minutes on the following site, and then you can post messages on almost anything about life in Shoreham-by-sea and the Adur Valley, including, Lancing, Sompting, Southwick, Steyning and the smaller villages in the valley. logo, and register as a new member. Allow 10 minutes on-line, but the process should be much quicker. Then you can go to the Adur Valley page and register to join. 1) Receive mail in a daily bulletin. 3) Choose not to receive EMails, which means you can visit the web page to choose what subjects look interesting. You can, also, just receive a list of the subjects in a daily digest. If the latter applies, you will have to click on the menu item Messages. 4) It is also possible just to receive a daily digest of the subject headings. These choices can be altered at a later date. They can also be altered by me, if you cannot work out how to do it. A flinty path leads from the top of Upper Kingston Lane to Southwick Hill under which the main A27 road burrows a large tunnel which is hardly noticeable from the vantage point 121 metres above sea level. A Comma Butterfly flitted amongst the heather and nettles on the way up. A few Clouded Yellow Butterflies would not settle, and a handful of Adonis Blues settled. Meadow Brown butterflies were frequently seen. A pretty little Small Copper Butterfly settled on some Ragwort on the path * going downhill east towards Mossy Bottom and up to New Erringham Farm and Mill Hill. It was harvest time and a pleasant sunny (22 ° C) day without the excessive humidity of late. An Emperor Dragonfly hawked at the top of the hedge at the junction of the road from Mill Hill to New Erringham Farm * . 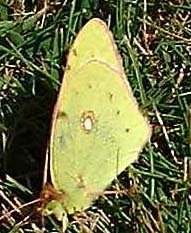 The immigrant Clouded Yellow Butterflies are now abundant near Shoreham Airport, with one every 6 square metres near the perimeter road (TQ 206 056) on the east side. The grass outfields are a rich tapestry of mainly Red Clover, Trifolium pratense. (Note: Zigzag Clover is a very similar plant and may also be present) and Bird's Foot Trefoil (Bacon & Eggs), Lotus corniculatus. The unidentified species of butterfly of 7 August 2000 was probably an orange coloured Wall Brown, Lasiommata megera, (It had lots of spots: I cannot think what else it could be) discovered in pairs and singly on the path from the Sussex Pad (TQ 181 064) to Lancing Clump. With its wings closed, on a small rock, this species is very difficult to spot. 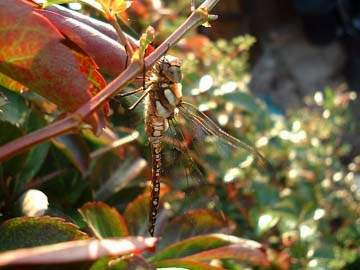 A large long-abdomen strong-flying Dragonfly (probably an Emperor Dragonfly) was on the wing, and there could have been a small fritilliary-like butterfly in the woods, that are traversed by a maze of paths. I have added some pictures and notes. wheelchairs. Main car-park at Cansheath [TQ 557 072]. Horsham and flows into the English Channel at Shoreham. Sea trout, trout, and very good coarse fishing. bridge and footbridge from High Street. Best in winter. Mill Hill has its own entry below. winter. Sussex Wildlife Trust. Can be viewed from footpaths only. Waltham Brooks [see below] or even Pulborough [see below]. Ardingly Reservoir.. 198 acre coarse fishery, pike. from rail station at Berwick on Lewes to Eastbourne line. Waltham Brooks [see entries below]. well as recent plantations. Fine flora and insect fauna. wood and is linked to Batts Wood via other public rights of way. such as sea beet. East of Birling Gap is a small area of chalk heath. Access to beach at Birling Gap [TV 554 960] and Cow Gap [TV 597 957]. Bentley Wildfowl. Captive ducks etc., but quite a few wild birds. Entrance on Harvey's Lane at TQ 477 162. Sussex/Kent border just west of Bedgebury Forest. Ancient Woodland. Ideal for Hassocks railway station. You can hide cars nearby. Woodland Trust. part of the Rye-Dungeness complex. Woodingdean. Access limited to footpath through reserve. Footpaths in area surrounding the reserve give access to other patches of chalk grassland. The whole area between Newmarket and Itford Hills is famed for its chalk flora and insects, especially butterflies [nearly 30 species] and Orthoptera [grasshoppers etc, 13 species]. Ring Ouzel regular on passage. Heavily used by ecologists from Sussex, e.g. Traditionally visited during Ecology course. north [car park off Warrs Hill Lane, near TQ 391 217]. be wrong. Huge [over 1100 ha] of channels, tidal mudflats and islands. church. Woodland Trust information board. grassland with scrub. Fine flora and good birdwatching, especially at migration times. Park at TQ 139 085. 21 ha of semi-natural Ancient Woodland. Woodland Trust information board. Leave car in Scaynes Hill. railway station] , past Hailsham, to Heathfield [TQ 579 215]. fish, roach, bream, chub, carp, perch, dace and pike. and Ditchling. National Trust and Sussex Wildlife Trust. Chalk grassland, scrub and ash woodland. Enormous views. Ditchling Common. Mixed habitats. Car park at TQ 336 180.
insect fauna. Close to Barlavington Down [see above]. hours], but incredible shingle site including RSPB reserve. Ferry Field. Viewable reserve at Pagham. very close to Crowhurst station. Can leave cars opposite church. Lovely wood. Footland Wood, Vinehall Street, near Battle. Mixed plantation. birdwatching site. Car park at TQ 518 003 has marked trails. Forest rides attract butterflies and include variety of flowering plants. Hope Gap, near Seaford. Traditionally visited during Ecology course. Iping Common, west of Midhurst. Adjacent to Stedham Common. Heathland. Car park at SU 853 220. Levin Down [SU 888 131], north of east Chichester. Chalk grassland with juniper scrub. butterflies. Long barrow and tumuli. Footpath to Mount Caburn [see below]. strikes southwest from TQ 399 184. Mill Hill [TQ 212 067], Old Shoreham. Chalk grassland overlooking Adur. fort on chalk grassland with some scrub. Noted for sweetbriar, a rare rose. Connected by footpath to Malling Down [see above]. Saltdean passes large Kittiwake colony and likely to see Fulmar andPeregrine. Walking on rocky shore is DANGEROUS and advise footpaths on cliff tops. Horsham, passing through Lewes on its way to the sea at Newhaven. Tidal from mouth to about 6 km upstream of Lewes. Notable for run of big sea trout. The walk between Lewes and Newhaven is easy and well served by public transport. Pagham Harbour [SZ 857 965]. Tidal saltmarsh, shingle. Park Wood, Hellingly, north of Hailsham. Bluebell wood [TQ 593 127]. Powdermill Water, Sedlescombe. 52 acres. Brown & rainbow trout. woodland. Car park off B2095. Visitor centre open daily 10 am to 5 pm. Sundays and Bank Holidays between Pulborough Station and Steyning. Ask to get off at Wiggonholt. More adventurously, two footpaths run from Pulborough: TQ 053 186 [car park] and TQ 062 184 [entrance to Brook Gate farm]. Brooks [see entry above] to Greatham bridge and Waltham Brooks [see below]. From there can retreat east along minor road until reach path to Pulborough. St. Leonard's Forest. Large plantations conceal three small reserves. Beds (TQ 212 308, Lily-of-the-Valley). rail station, move south to sea. Seven Sisters Country Park [TV 51 99], between Seaford and Eastbourne. Car park off A259 to east of river. Varied flora from saltmarsh to fine chalk grassland. Good for all-round natural history. Stedham Common, Midhurst [SU 856 218]. Adjacent to Iping Common. Rivers. See entries for Arun, Adur, Ouse and Cuckmere [west to east]. entries] is an interesting walk. to Greatham bridge. From Waltham Brooks can retreat east along minor road until reach path to Pulborough [see entry above]. Washington Warren, Washington. Open access National Trust. involved with this local reserve. Entry through Batchelor Way off the B2102 immediately after the turn off from the A22 [TQ 464 210]. area of semi-natural Ancient Woodland in a well wooded area. Woodland Trust. Wildlife Trust. Excellent information centre. Distribution maps automatically up-date as you enter data - no need to keep re-making them! Copy and Paste presentation quality maps and tables into other Windows applications. gamut n. LME. [Contr. of med.L gamma ut, f. GAMMA name of the symbol (not included) (repr. in the Middle Ages a note one tone lower than A) + UT first of the six notes forming a hexachord.] I Mus. 1 Hist. The lowest note on the medieval sequence of hexachords, equal to modern G on the lowest line of the bass stave. LME. 2 Hist. A large scale (ascribed to Guido d'Arezzo), formed of seven hexachords or partial scales, and containing all the recognized notes used in medieval music. L15. 3 The full range of notes which a voice or instrument can produce. M17. 4 The major diatonic scale; the scale recognized by any particular people or in any period. E18. II 5 transf. & fig. The whole range or scope of something. E17. 5 C. BEATON Her resonant voice covers the gamut from an emphatic whisper to an almost Rabelaisian roar. Rabelaisian a. & n. E19. [f. Rabelais (see below) + -IAN.] A adj. Pertaining to, characteristic of, or resembling the French satirist François Rabelais (c1494-1553) or his writing; marked by exuberant imagination and language, coarse humour, and satire. E19. B n. An admirer or student of Rabelais or his writing. L19.Rabelaisianism n. the characteristic style or attitude of Rabelais; a Rabelaisian feature or characteristic: L19. Rabelaism n. Rabelaisianism E19. The upsurge of EForums on all subjects (a few have been recommended before in these bulletins) are an important way in which the Internet will change the world. Passenger air services in operation from Shoreham Airport to Jersey, Birmingham and Liverpool. The railway station serving the airport was originally called Bungalow Town Halt (opened 1910), but renamed Shoreham Airport Station (in 1935), the first station to serve an airport in England, in 1930. Please send in any details of local events. For any company or organisation wanting nationwide green publicity, there is an opportunity to sponsor the journal "Glaucus" of the British Marine Life Study Society. There remains sponsorship opportunities on the BMLSS (England) web site and other publications, including Torpedo. Sponsorship is also available for the Adur Torpedo Electronic News Bulletin and the Shoreham-by-Sea web pages (which preceded the Adur Resource Centre web site), which would be more suitable for a local firm(s). Submissions accepted by EMail only. Adur Torpedo was written, designed and distributed by Andy Horton. Links to earlier issues (for subscribers who have downloaded the Bulletins only, and web site visitors).